Fold width varies from 3” to 1.5” in 0.5” increments. 3” is the most economical and also the most common. Some skirting situations require smaller fold widths due to allowable measurements. These smaller fold widths add some to the cost of the skirting because of the increased number of folds to reach the requested height. The convolutions, or folds of the skirting, can be mounted “outside” of the lift deck or “inside” the lift deck. When they are outside the lift, the scissor lift table deck is used as the I.D. dimension of the skirting. 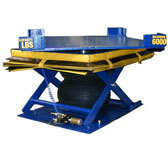 When the folds are inside, the scissor lift table deck is used as the O.D. of the skirting. In all cases it is important to make sure the I.D. of the skirt will not interfere with any part of the interior of the lift. Vents are very important to the action of the safety skirting during the movement of the lift. When the lift moves up the area inside of the skirting must draw in air due to its increase in volume. The opposite is true when the lift is lowered and the air inside of the skirting must escape. The safety skirting must have a way for the air to transfer in and out. This is accomplished with vents when the skirting goes all the way to the floor (most cases). If the lift is up on casters and the air can escape the bottom or if 3 sided skirting is all that is required then vents may not be needed. Our skirting is made of PVC coated polyester, an industrial grade vinyl. Our standard is a 22 oz non-flame retardant skirting. If flame retardant skirting is desired we also offer a 23 oz FR . Many of our competitors offer a weaker 18 oz that may work but will not hold up as well over the life of the skirt. Stiffening wires can be installed in the scissor lift skirting every other fold to provide protection to a push or brush from the side. The wires are made of 0.125” thick spring steel. They come pre-installed in the skirting. When the safety skirting is unpackaged the wires spring strait. Stiffening wires are recommended on skirting with sides over 50”. All skirts come with a mounting pocket on top and bottom unless otherwise requested. We have the option of including a 1” x 1/8” steel or aluminum flat bar, with self tapping screws supplied, to slide into the pocket. We offer a 3/8” steel weight rod that can be used in the bottom to help keep the bottom convolution in contact with the floor. Another option would be to use Velcro on top and/or bottom instead of a pocket. The Velcro comes with loop sewn to the attachment panel and adhesive backed hook attached. Maintenance ties are used the hold the skirt at the top of the lift in cases where the inside of the lift needs access. These are sewn into the top panel and utilize snaps to function. We have access to a wide array of colors to meet any need. The standard colors are safety yellow and black. We can also do solid yellow or solid black safety skirting at no increase in cost. Colors other than yellow or black have a slight increase in cost. If your Lift Table Bellows has an installation situation that requires the skirt to wrap around the scissor lift in order to be installed the Velcro corner is the answer. The skirting will come with one corner that can be split and re-attached after installed if this option is selected. This is needed in situations where there is no way to slip the accordion skirting over the deck of the scissor lift. Once re-attached, the Velcro corner of the lift bellows still retains its strength. Another stiffening option that provides resistance to a side wall push is plastic stiffeners. Like the spring steel stiffening wires listed above, plastic stiffeners are sewn into the sides of the skirt. These 0.020” thick pieces of plastic can be added to every other fold or every fold. They can be used when collapsed height is an issue and stiffening wires will not fit. We have fabricated many accordion bellows and lift table guards the all types of industries that do not fit the common 4 sided rectangle mold. 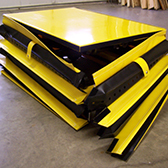 Fabrication of multiple sided safety skirts with cut-outs to specialized round bellows or accordion skirts for lifts that move laterally as well as vertically, it is all possible with Foremost Flexible Fabricating. For special needs skirts please e-mail or call and our professional sales team will help you get what you need. To honor God through Christian business practices and through the goods and services that we provide is the purpose statement of Foremost Flexible Fabricating, Inc.